Where s = (a + b + c + d)/2 known as the semi-perimeter. The quadrilateral ABCD shown in Fig. 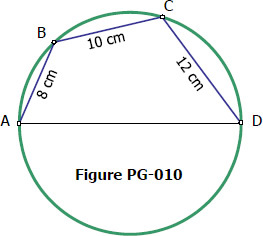 PG-010 is inscribed in a circle with side AD coinciding with the diameter of the circle. if sides AB, BC, and CD are 8 cm, 10 cm, and 12 cm long, respectively, find the radius of the circumscribing circle. 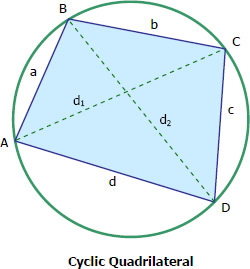 A quadrilateral is said to be cyclic if its vertices all lie on a circle. In cyclic quadrilateral, the sum of two opposite angles is 180° (or π radian); in other words, the two opposite angles are supplementary. Find the rectangle of maximum perimeter inscribed in a given circle. Find the area of the regular six-pointed star inscribed in a circle of radius 20 cm. Find the area of the regular five-pointed star inscribed in a circle of radius 20 cm. where At is the area of the inscribed triangle. This page will define the following: incenter, circumcenter, orthocenter, centroid, and Euler line. Incenter is the center of the inscribed circle (incircle) of the triangle, it is the point of intersection of the angle bisectors of the triangle. where At = area of the triangle and s = ½ (a + b + c). See the derivation of formula for radius of incircle.